Is Campground Drinking Water Contaminated? You are here: Home / Top Stories / Are You Drinking Contaminated Campground Water? Part of the clean drinking water problem is with how each water system is governed by the state and/or county (Dept. of Health) which may or may not require regular water testing for small water systems. In our state the RV park in which I reside the state requires regular testing of the park’s water system comprised of several wells, well pumps and delivery lines. The main reason for the regular testing and monitoring by the state is the well once had problems where state inspectors were called in. Once a troubled water system is discovered it’s then up to the governing agency to decided whether regular water testing is required, In cases such as this one testing usually becomes mandated for the life of the water system. Same as when an water system is updated. State and local regulations require a water system be insepcted and often engineers are required to be hired to complete the upgrade. Once the upgrade is completed usually regular water testing, where the owner must send in samples every so often also becomes a requirement. Privately owned water systems that doesn’t provide public drinking water testing is usually not required unless the pubic agency such as the Dept. of Health is called in. Our State’s Dept of Health only “recommends” that private well owners test their drinking water every year for coliform bacteria and nitrate. I think this is a flaw in the system, as RV parks even though they service the public are often considered to be private water systems. Private well owners often don’t send in test samples to a local government as they don’t want to become under the jurisdiction of the dept. of health which can demand and implement expensive upgrades, maintenance, water treatment, etc. or the well can be closed down. Small water systems serving as little as a few to e.g. a hundred homes, typical improvement costs can cost into the hundreds to millions of dollars. The RV park which I reside once had a problem where state inspectors were called in. It’s now required to have regular water testing. Plus the state will only allow certain types of upgrades and improvements. The owner told me they wanted to implement a water treatment, but since it wasn’t state approved the state won’t allow it as an upgrade. The Parks water normally passes water tests (except for a couple times that I can remember, where waning notices were issued) However the water isn’t always clear, sometimes turns brown, brown water can pass state water tests, if no too murky the water is passed as clean drinking water. I normally run a filter at least on my internal cold water line. IIRC the water filters down to one micron removing contaminants and making the water clear. However water filters do cost money $$$ and it’s usually recommended they be changed every so often such as once every three months, etc. If really concerned about the water quality at your location and/or when traveling I would suggest spending additional for a reverse osmosis or perhaps a system as suggested in the article that purifies water through Ultraviolet Light. I’ve used one of the light purifiers and they do work, but not as fast as a regular water filter as it usually takes some time for the ultraviolet light to purify the water. If you don’t want to go to the trouble of installing a filter in the RV, under a sink, from the water supply line. I recommend a gravity feed water filter in order to keep up to a several gallons of purified drinking water available. The filters usually installed in a small to large metal containers normally last for quite a while and are not difficult to change. Great asset to any home or RV even if you don’t have a water quality problem, provides cleaner than tap water quality water. Public tap water though normally regularly tested doesn’t necessarily provide the best drinking water for human consumption. This type of water filter normally does a good job of water filtering and can be used with muddy, stagnant and most polluted water unless there are some sort of chemicals in the water that their filters are unable to filter out. There are water test kits available for around $10.00 where you can privately mail a sample of your drinking water and the company will send you back water quality test results. If you suspect the water in your RV park and/or campground is contaminated there should be methods and avenues where you can send the contaminated water test results to a local health dept. Contamination can happen at full hookup sites when a water hose is hooked up to the sites water faucet and then it’s used to attach to the blackwater flush out valve to flush out the black water holding tank and no backflow preventer is attached. Or, the hose could have already been contaminated. E coli and God knows what else will flow back into the Parks water system. 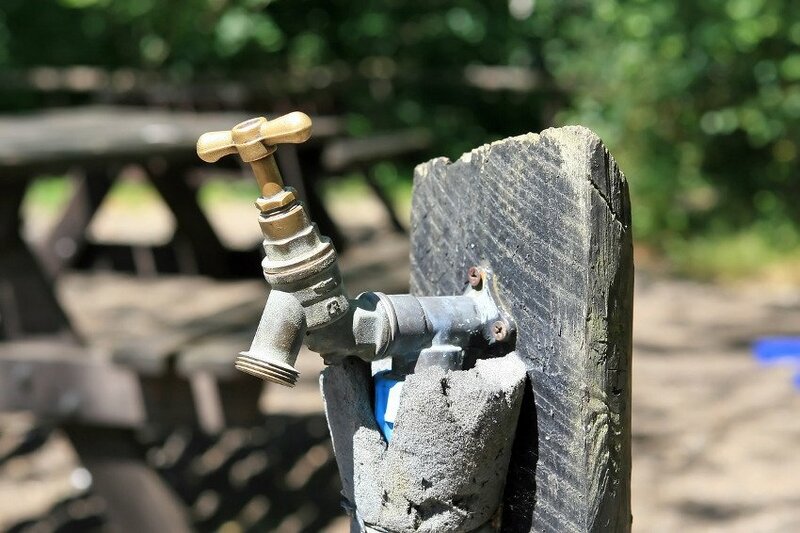 Even if there is a backflow preventer already on the park faucet, there’s still potential contamination left on the faucet end to contaminate the next campers white hose. We always travel with a stainless steel, ceramic element “Travel Berkey” water purifier. We have it because we like the taste of chlorine free water anyway. We filter all the water consumed inside. Just to show how things can accidentally happen, when we arrived at the sister in laws.place for a stay, we accidentally hooked up the 5th water supply to the wrong water faucet. It was connected to the Colorado River agricultural irrigation system water. Sis in law was horrified to see what we had hooked up to when she got home from work. But, no problem. Even though we had consumed some river water, we had filtered it through the Berkey. This of course wasn’t intentional, but we bought the Berkey because they are used to purify water from the Nile, to the Ganges, to the Amazon and.other contaminated sources. If it’s good enough for that, it’s good enough for household use. You never know. All my drinking water and cooking water come from preperchased bottles. Dish washing uses soap which can kill any contamination. I don’t have a dishwasher and wash my dishes if possibly without any soaps involved. However once in a while I do use a dish washing type soap. All soaps have an effect on dishwashing so it better not to ever use any type of soap if possible. I’m not saying that the incidents reported here didn’t happen, but I would contend that they are rare considering the number of RVers in the US and Canada. We have been full-timers for >6 years and have stayed at dozens of CGs along our 55,000 miles of travel. We always drink the water and don’t have anything more than a sediment filter. We’ve been just fine. Maybe we’ve just been lucky, but IMHO this sort of “scare article” simply results in people convincing themselves that they need to carry bottled water for everything they eat or cook. Except, of course, there have been plenty of scare news stories over the years pointing out how little any of us know about the water we routinely buy in bottles. Everything in life entails risks of some sort. Because so many RVers are elderly they are naturally risk averse. If you get them too riled up they may decide that RVing in general is too risky a hobby. That would be a shame. It seems like it’s best to bring your own water on camping trips, especially if your campground owns a private well. Thanks for sharing this information! It’s important to use a water filtration system in your RV. There are many harmful contaminants that might not get you sick right away, but will linger in your body causing havoc . We use multiple filtration systems in our RV…CLEAR2O universal water filter (1 Micron), CLEAR2o countertop filtration system (Solid Carbon Block filter) and inline filter. These products are designed with superior technology to ensure the best filtration and we have only good things to say about it. Regardless of the state or campground we know we are doing our part to ensure we are using and drinking the best filtered water. Much of the bottled water on the market is plain old tap, water. If it’s actually from a pure fresh underground spring water I’d be skeptical. Most bottled water is a total waste of money and also pollutes the environment. The oceans and other bodies of water on the planet earth are filled with plastic bottles, bottle caps, plastic bags, little pieces of plastic, etc. These products are creating huge garbage dumps in all of the oceans of the planet. The plankton which feeds sea animals is turning into a form of plastic. Where the plastic has integrated itself into the plankton. Seabirds bellies are becoming full of plastic as they mistaken plastic for food. I remember reading this also has something do with how plastic smells to animals looking for food. Humans need to get rid of these use once throw a way plastics. They also need to stop claiming and stealing water to only make profit. This article is EXTREMELY misleading. It’s trying to scare people into purchasing an expensive, unnecessary water filter. Campground’s are required monthly testing of their water supplies in most states. While contamination is not impossible, it’s highly unlikely that you would get sick from a campground water system. I’m not sure where you go camping Robyn in which state. Across our country some Public water treatment plants are in some bad shape. They don’t have the million dollars of upgrading their system. Most! doesn’t mean all states, it could mean a few States. For not having a number of states that requires Health department you are just taking information at will. The question is would you ask yourself? Would you spend a few dollars on your family, kids and grandkids Health. I’m not sure if you heard about Flint Michigan or what happened in Toledo Ohio a few years back. Plus it was a bail out from the taxpayers to fix their problems that they ignored of years of not doing nothing. Accountability which is in question? Is City government running for the best interest of the people or the general public for SAFE QUALITY Drinking Water. The cost of driving and seeing the doctor is costly these days. I’ve been RV and since 1990 when I was 21 years old working on the road I remember replacing that $40.00 standard filter that you buy at the home improvement store. Replacing every 3 months back then. It is always good to have a sediment water filter to get rid of it doesn’t go into your hot water heater, showers door and the toilet. I upgraded & Purchased years ago (2) 22” water filters yes it cost me $100.00 And I do have white PVC pipe for covers so a rock can’t chip or break my filters. The sediment filter cost me about $5.00 and I replace every 2 to 6 months depending on the RV park I’ve been in. The chlorine filter cost me $20.00 which lasts about 6 months. Surprising it does filter out the sulfur in the water, which I replaced every 3 months in one Campground. If you would see my old filters from brown, Black to the color of grape wine. I’m sure you would buy a water filter. Seeing & pictures shows 1000 words. Plus when your neighbor see your old & new filter they will make a well educated decision of the important too. I stayed in some Campgrounds and you were able to tell if they’re about ready to close, and I’ve been in few RV resorts too. Not all wells are the same it depends on the depth, if you enjoy drinking filtered lake water with some big cities do? Start doing reading & the research the chemicals are filtering into our water table. Here’s the question to ask yourself why do they add fluoride to the water when it is hazardous material in buckets at the water treatment plant & adding to the water that comes from your tap. When you go to the dentist as a child you could not swallow the fluoride anyways what does that tell you. Best investment I ever did and it’s pays for itself and I don’t have to pay $16 for a glass 5 gallon carboy of Mountain Spring Valley water which is fantastic drinking water. Even their Berkey carbon filters will last 18 years for a family of 4 to drink water, go to their website and read the reviews and the companies feedback to the peoples questions. Thank you to all that have read this and wrote a positive review. We use bottle water for cooking and drinking. When we leave home we try to include a good supply of our own water. We don’t throw our used bottles out in the garbage. We try to drop them off at a recycle barrel. My family and I use the new Clear2O RV Inline Water Filter (lime green color). It filters the water at the one micron level (solid carbon block), the previous filter I used was blue and that was 100 micron filtration. Big difference of water taste, got rid of the rotten egg odor and now there is no need to purchase the water bottle because I use it for drinking, cooking and showering. Highly recommend the product and they sell it on Amazon and Walmart.